Fish containing high levels of heavy metals is causing development disorders and disease among Ahwazi Arabs, according to a number of recent studies. 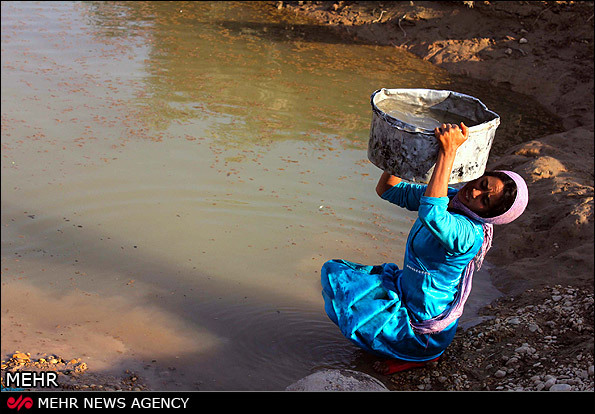 Consumption of fish living in the heavily polluted rivers of Al-Ahwaz is affecting embryo growth, while contaminated drinking water is causing disorders of the central nervous system, according to the report. Residents suffer high levels of fatigue, blood disorders and diseases affecting the lungs, kidneys, liver and other vital organs as well as miscarriages, cancers, osteoporosis, endocrine disorders, Alzheimer's, Parkinson's Disease and learning difficulties due to the ingestion of toxic metals. The main sources of heavy metals such as lead, aluminium, mercury, copper, cadmium, nickel and arsenic in the environment are sewerage and industrial waste. UK-based cancer specialist and Ahwazi activist Amir Saedi said: "Heavy metals are stored faster than they are broken down or excreted. They are stored in blood vessels, muscles, bones and joints. In cases such as zinc deficiency, cadmium replaces the deficiency and results in serious health problems." Environmental problems in the rivers that traverse the Ahwazi homeland have been a long-standing concern among Iranian scientists and a major grievance of indigenous Arabs, who suffer serious illnesses. Over the past decade, Ahwazi Arab fishermen have reported outbreaks of disease among fish and a sharp decline in catches, indicating that Iran's mismanagement of water resources has devastated river life. Exacerbating the problem is the government's ongoing controversial river diversion programme, which involves constructing a series of dams to take water to provinces such as Yazd where water is scarce. According to a 2011 study by Iranian scientists entitled "Assessment of Heavy Metals Concentration of Fish (Liza abu) in the Karoon River, Khuzestan province", samples taken from 72 specimens showed high levels of industrial heavy metals accumulated in liver and gills of bottom dwelling fish. It was found that the concentration of lead and manganese in L. Abu fish is 1mg and 0.7mg respectively, far higher than WHO standards. Another Iranian study conducted in 2011 using samples of hilsa and shirbot fish in the Karoon river found high levels of nickel, cadmium and lead that were significantly higher than commonly accepted standards elsewhere in the world. Another study that appeared in 2010 in the peer-reviewed Journal of Fisheries, published by the Iranian Fisheries Research Organisation, entitled "Heavy metals (Hg,Cd,Pb,Ni,Cu) concentrations in Euryglossa orientalis and sediments from Khur-e-Musa Creek in Khuzestan Province" found samples containing an average concentration of mercury, cadmium and nickel that was far higher than international standards. The source of the pollutants is believed to be waste waters from industries located in the Ghanam Inlet, particularly Razi, Emam and Farabi, as well as ports and shipping, the oil industry and metals producers. Other contaminants originate from the Iran-Iraq War (1980-88) and the Gulf War of 1990, which caused an oil spill volume of 11 million barrels. In March 2007, two of Iran's leading ecologists claimed that the Bandar Imam petrochemical complex is causing environmental devastation. Research by Dr Abbas Ismail Sari and Dr Bahram Kiaee found that a large area of Khuzestan is seriously affected by pollution from mercury and other dangerous chemicals used in petrochemicals manufacturing. In December 2006, a conference Azad University in Ahwaz City heard that the Iranian regime's industrial policies are causing environmental chaos in Khuzestan. At the conference, Dr Hormoz Mahmmodi Rad, the head of Khuzestan's environmental organisation, described situation affecting the province's natural environment as "worrying" and "chaotic" with serious consequences for human health. He emphasised the need for planned industrial development with action to stop the industrial pollutants from pouring into the Karoun River. The Karoun is an essential water source for agriculture as well as fishing, which together provide the largest source of income for indigenous Ahwazi Arabs. Dr Mahmmodi Rad warned that the province's natural environment was in a perillous state, with biodiversity in the marshlands severely threatened and some animal species could face extinction as a result of industrial pollution. Earlier in 2006, controversy erupted over pollution from the Bandar Imam Petrochemical Company, a subsidiary of the state-owned National Petrochemical Company, following the death of thousands of fish off the Mahshahr (Mashour) coast. Some Gulf states banned seafood imports from Iran due to radioactive contamination, indicating that marine pollution is a long-term industrial disaster.